With VVols implementation, a VM may need as low as 5 VVols and as high as 100s of VVols (with snapshot, clones etc.) and a 1000 VM install would require 10s of Thousands to 100s of thousands VVols. The VVol race that the storage Vendors are starting now was won by Tintri four years back. If you would be evaluating VVols in the coming weeks/months, you should definitely read this blog here to understand what you should ask from your storage vendor when it comes to VVols. Tintri from the beginning focused on using software to drive innovation and one of the key differentiators about the technology is its ability to deliver 99-100% IO from flash, which is driven by our software unlike all-flash vendors that use Brute Force to deliver performance. 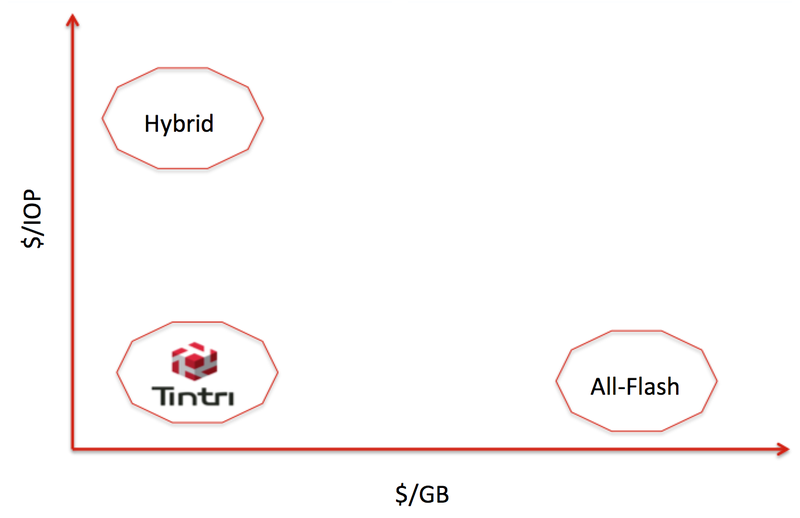 The advantage is that Tintri can address a broad spectrum of workloads at a very low cost. What it means is that unlike an All-Flash solution where $/IOP is low and $/GB is high or a hybrid solution where $/IOP is high and $/GB is low, Tintri brings both $/GB and $/IOP at low levels without over depending on Space Savings (Dedup & Compression), therefore delivering a better $/workload at a very high density. Our focus on Virtualization continues to help us differentiate and bring new Virtualization & Cloud Centric functionality faster to the market. The result is a platform that is 5-10x cheaper on CAPEX, 60x cheaper on OPEX and highly scalable. Why Tintri’s milestone of 200,000 VMs and 16PB of Storage is bigger than you think? Yesterday we announced a significant milestone of 200,000 VMs deployed on Tintri with close to 16PB addressed by these VMs. Now, these numbers may not look big on their own, but they become really interesting when you combine it with the fact we have doubled the number of VMs in last 6 months and that capacity numbers are for VMs experiencing sub-ms performance. All of this has come at the cost of incumbent storage providers where Tintri beat Modern & Traditional Storage Vendors in process. Tintri brought a revolutionary Storage platform in 2011 designed for Flash just to run VMs and vDisks. The idea was to have a storage platform that was designed with Virtualization in mind and not Physical Workloads. To date, Tintri VMstore is the only external, best-of-breed platform that has laser focus on Virtualization. The General Purpose Platforms (Traditional & Modern, Flash & Hybrid) continue to focus on Physical workloads even as the customers are moving towards 100% virtualization. Where Tintri continues to have edge across multiple Hypervisors is the vDisk level visibility of workloads as compared to General Purpose Platforms that have no idea about what happens at the Hypervisor layer. One of the drawbacks of this is the IO blender effect that everyone talks about with no effort to provide any solution except throwing flash at it. Tintri is the only platform that addresses it, delivering high performance, sub-ms response times, vDisk granular isolation, predictability, analytics across the infrastructure and per VM data services. VMware VVOLs is the step in the right direction but it is just an enabler for one hypervisor and it’ll depend upon a vendor on what functionalities it brings to the storage platforms. With all our experience in managing and understanding VMs, Tintri is committed to bring all the goodness that the customers have experienced on the VMstore and much more to VVOLs. And only Tintri would be able to provide customers a choice of deploying VMs either with VVOLs or with an open implementation like NFS without compromising on functionality. How will we maintain this growth, as the base gets bigger? Tintri has a solid roadmap. Our focus on Virtualization allows us to bring better functionality around Virtualization & Cloud, much faster to the market. We don’t have to try to be good for all workloads as other General Purpose Platforms and in process compromise everywhere. We are the best Storage Platform for Virtualization & Cloud and would continue to be so for a long time. If you want to experience all-flash performance for all your virtualized applications (not just the critical ones) at 1/4th of the cost of an over-provisioned flash array (through over-sold dedup and compression) with all the analytics, auto-tuning, VM granular goodness and isolation that our customers are experiencing, I would encourage you to contact your Tintri Rep or your preferred partner. If you plan to attend VMworld, we are going to have big presence there. You can book a Private meeting with Tintri or attend one of our sessions. See details here. Yes, I have taken the plunge and I am on to a new challenge. I had a great ride at NetApp and I will cherish every moment I spent there, learning a lot which helped me grow both personally and professionally. I think it is important to take on new challenges and adapt to changes because nothing ever stays the same, which means unless you can adapt and change too, you will be stuck doing the same things, which could then make your life a lot harder than it needs to be. So, what makes Tintri so special? I met a relatively new NetApp customer a few weeks back for discussing the best practices around vSphere and NetApp. While going through the some of the stuff, he brought up a point around VSC Backup & Recovery (SMVI) that when he tried restoring a complete Datastore from a NetApp Snapshot backup, he found it to be much faster than restoring a VM from the same Snapshot. I explained to him that while the Datastore restore utilizes SnapRestore which simply reverts the pointers of the volume to a previous point in time resulting in near-instantaneous restores, the VM restore utilizes something called Single File SnapRestore (SFSR) which copies back the files from the snapshot copy to the Active File System. While the above process is great for instant restores, wouldn’t it be nice if the SFSR process itself was faster?